On 1st September at 11.04 am (Italian time) the New Moon will fully manifest itself in the sky, generating also a Solar Eclipse at 9°22’ Virgo Decan 1. The symbol of Virgo generally depicts a beautiful woman with the ear of corn, or the sheaf of wheat, or the branch of fruit in her arms. The root of the word Virgo goes back to an ancient Atlantean root name applied to the mother principle and, for that reason, lately associated to Mother Mary in the Christian tradition. 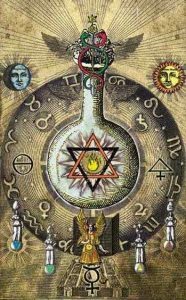 In the ancient times Spirit represented the creative principle, while space was considered as the womb for the aggregations of the four different elements of creation – fire, air, water and earth – through the two cosmic forces of Love and Discord, according to a cyclic eternal process. Matter was perceived as the result of this on-going cycle, hiding within itself the possibility of tracing back to its original Divine source. In the astrological colour rose Virgo is associated to olive green. Olive is related to the quality of joining together what is permanent and impermanent, above and below, Spirit and matter; it carries a bridging-like energy and it holds the promise of a New Land, as it refers back to the olive branch brought to Noah by the dove after a time of flood and darkness. Olive green is also related to the Holy Spirit. In the Jewish, Christian and Muslim traditions the Holy Spirit is the Spirit of God. The word Spirit comes from the Hebrew ruach, which means wind, breath. Holy Spirit is שדוקה חור, “Ruach haQodesh” and it represents the Divine power that can fulfil our human nature. 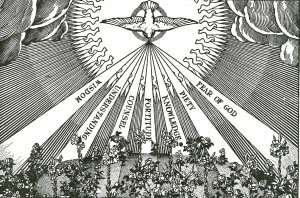 In the Old Testament the Holy Spirit is described as taking part in the creation (creative quality), which continuously regenerates through the living breath of God, and portrayed as the Spirit of God leading and guiding His people through great life changes. According to the Bible (Isahiah 11:2-3) the Holy Spirit is the bringer of seven gifts or qualities that can illumine our heart and mind: wisdom (sapientia), understanding (intellectum), counsel (consilium), fortitude (fortitudo), knowledge (scientia), piety (pietas) and fear of God (Timor Domini). We receive them when we are infused with sanctifying grace – the Life of Spirit within our soul – that is the grace that prompts us to act accordingly to the Higher will. As we receive these seven gifts, we naturally obey divine inspirations as we truly feel it is the only and right way. In Esoteric Numerology 7 is the number associated to “fusion”, the alchemical process where Spirit and matter become one and the individual, the personality, becomes invisible to allow the coming together of two realities before experienced as separated. When something in matter “dies”, it is because there is a withdrawal of energy – a disaggregation – so that a new order may arise. When the Kundalini energy, the awakening, starts rising up the spine and reaches the olive area within the body, between the Solar plexus and the Heart chakras, the process of change is triggered. This is the time where we are asked to let go of what is not in alignment to our soul quality in order to be true to whom we truly are. In its challenging aspect Olive is bitterness, it is the need for the process of marination (where salt is added) to be experienced in order to reveal the sweetness of Spirit and to manifest the Soul hidden within matter – the body. The New Moon in Virgo implies “the separation of the wheat from the chaff”; we will be asked to face the old and asked to re-evaluate our lives according to our soul. The Sun and the Moon will be conjunct to Alioth, a star situated on the root of the tail of the constellation of the Great Bear (or Ursa Major). 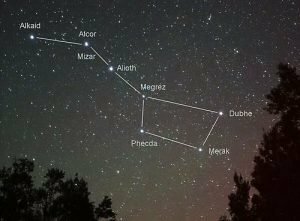 Ursa Major has been called “the Bear with her train,” where the “train” refers to the stars Alioth, Mizar and Alkaid, forming the tail of the Bear. In the ancient times the Arabs used to portray these three stars as “mourners” around the coffin, marked by the Plough, indicating that this constellation could be symbolically interpreted as a funeral procession. Funerals represents endings, moving from one state or another, highlighting the fact that we will truly become aware of an ending and, as Alioth means “intensely bright” (so bright that it can burn your eyes), things will be risen to the light and we will be given the strength and certainty to make good choices. The Kabalists associated Ursa Major to the Hebrew letter Zayin and the 7th Tarot Trump The Chariot. A Chariot is a traditional war instrument, as it can be perceived as the triumph of the strong over the weak. Here the Chariot has a different quality because we are asked to internalize that war not as a conflict, but as a fusion between two inner aspects – the personality and the soul. The only thing that would die in this process is the misunderstanding and ignorance about who we truly are. The only resistance that we have to overcome, which is made of all our survival and habitual habits, is the fear of that fusion in order to start blazing the trail ahead instead of trading the mill. The Hebrew letter Zayin means sword and it refers to “a Woman of Great Value”, symbolic of matter rising to a higher state of consciousness through the revelation of the soul quality. This New Moon will form a magnificent Grand Mutable Cross in the sky with Saturn at 10°04’ in Sagittarius, conjunct Mars and the Fixed Star Antares, Neptune at 10°40’ in Pisces, conjunct the South Node, and the Fixed Star Aldebaran at 10°01’ in Gemini. 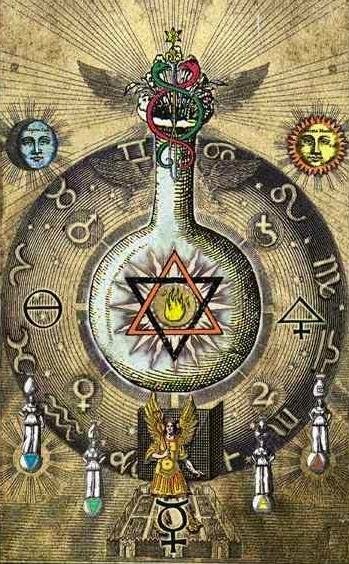 Esoterically, the Grand Cross is a 4th Harmonic aspect pattern. In numerology number four is associated to the 4th Ray of Harmony through Conflict and it refers to the possibility of building up a stressing situation, where we may feel insecure or uncomfortable, so that a new energy can be released – the 4 celestial corners/bodies will trigger a friction creating the necessary heat to catalyse and calcinate down the old structure in order to forge a new form through the harmonization of the energies involved in the four directions of the Cross. When Mutable signs are involved, the Grand Cross speaks about completion and re-evaluation. As we wrote in one of our previous blogs, Saturn increases the urge for a true sense of identity, asking us to be open to see with honesty the reality of the Soul on one side and the deceptive ideas that the personality holds about who we are or should be on the other (the self-deception will be emphasised by Neptune and the South Node in Pisces). His conjunction to Mars and Antares, a Fixed Star in the Heart of Scorpio at 09°46′ Sagittarius, reveals the intense need for the inspiration coming from the Higher Mind to be expressed and manifested in the vehicle of the body (matter). Antares is regarded as success in any kind of conflict and, opposite to it, we have Aldebaran, one of the four key stars in the heavens, also called the star of Archangel Michael, the military commander of the Heavenly Host. Archangel Michael won the war against Lucifer in Heaven. The battle in the celestial spheres had started because Lucifer did not want to serve, which means that within us there is an aspect of resistance to acknowledge and obey to our soul nature, to Love and Truth as the highest forces in the universe. 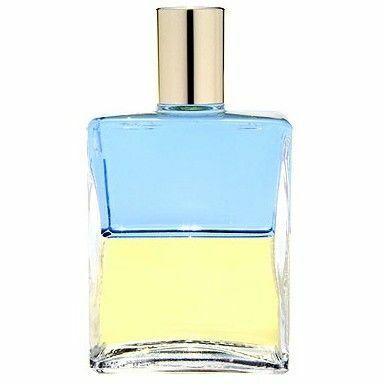 In the Aura-Soma® colour-care system Archangel Michael is associated to bottle 94, pale blue over pale yellow. The pale blue is the Higher Self, the Soul, the pale yellow, the little self, the personality, coming together in the pale green, which is the Way and the Truth of the heart; yellow is about the letting go of the fear of the personality to fully trust and awaken to the Higher plan (blue). Archangel Michael’s sword of insight and Truth – the Zayin – is drawn in the sky, opening of a time of great change in our lives. The old way of being collapses for the new soul-based one to be born. «What comes, will go. What is found, will be lost again.